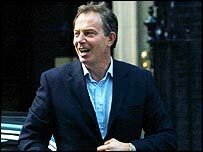 A watchdog has concluded Tony Blair did nothing wrong by failing to declare a holiday with a tobacco industry figure, Downing Street has said. The Parliamentary Commissioner for Standards, Sir Philip Mawer, investigated the prime minister's stay at a French home of Alain Perrin. A Tory MP, Chris Grayling, had complained the stay was not in the MPs' register of interests. But the stay did not need to be declared, Downing Street said. "Sir Philip Mawer, the Parliamentary Commissioner for Standards, has dismissed a request from Chris Grayling MP that he should investigate whether or not the prime minister should have registered his stay with Alain Perrin in August 2002," the spokesman said. "Sir Philip agreed with the prime minister's decision not to register the hospitality and said there was no merit in pursuing the issue further." The Blairs stayed with Alain Perrin, then chairman of a company said to have a stake in British American Tobacco, in 2002. The Sunday Telegraph newspaper said the family spent five days in Mr Perrin's 15th Century chateau in south-western France. The Commons rules state that an MP is required to disclose any information of any "material benefit which ... might reasonably be thought by others to influence his or her actions, speeches or votes". Mr Blair caused controversy three years ago when his family stayed in Sharm-el-Sheik at the Egyptian taxpayers' expense. Since then he has paid for two further visits.